I’m blaming this one on the sunscreen in my eyes. And I’m blaming it on that little Tart. She always causes trouble. Thanks for playing Q. Well done. 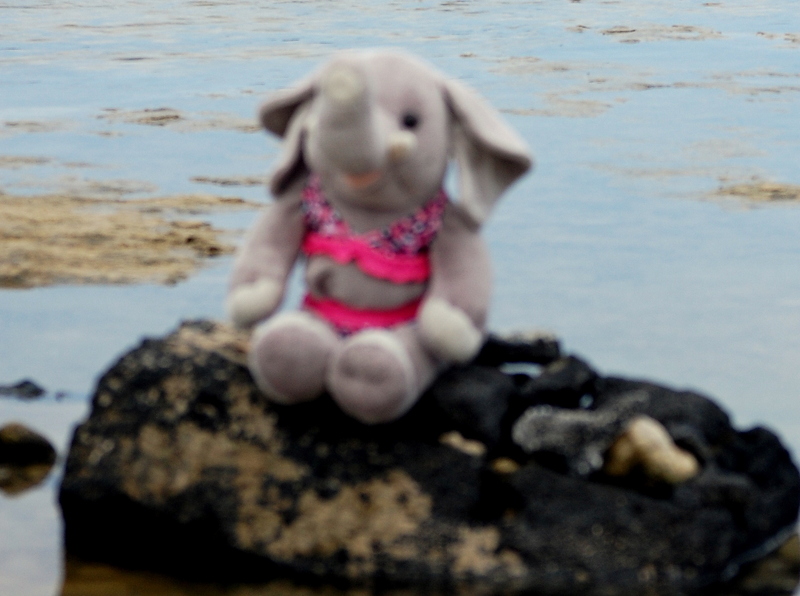 Sunscreen or otherwise, Ella is still modeling a cute bathing suit. It has an artistic airbrushed quality. LOL. Ella already posed so well. I’ve got to agree with Karen. That is a cute bathing suit. Ella still looks gorgeous. Just say you did it on purpose; it looks like when a movie goes all soft on the focus. Love her cute little suit! That’s how clearly I can see when the sweat is dripping in my eyes. Poor little tart cannot even get a decent picture of her! Quilly you’ll just have to do better next time! Are you sure it wasn’t the margarita?